Now it seems like an afterthought, but back before teams were as comfortable with ticket auctions (thanks StubHub! ), longtime Blackhawks and Cubs sponsor, the Chicago Board Options Exchange, launched its own online ticket auction as activation for its hometown sponsorship deals. With both deals now in their fourth year, company executives recently drew on the example to show how CBOE is expanding its reach as a newly public, NASDAQ-traded company. 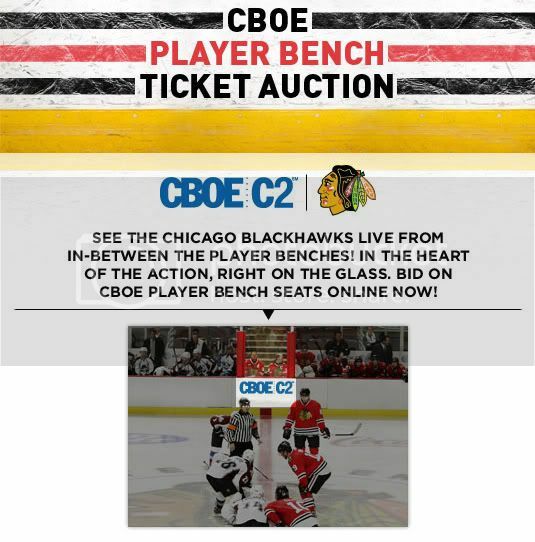 "With both the Cubs and the Blackhawks, we have a section of seating called the CBOE seats which are good seats where the price is determined utilizing an online auction as opposed to a fixed price, thus the connection with CBOE as an organization that facilitates price discovery," Ed Provost, Chief Executive, Vice President, Business Developments recently commented at the company's first Investors Day. In 2008, CBOE's Cubs partnership was the first-ever auction of Wrigley Field season tickets at www.cubs.com with bids ranging from from $31,000 to $80,000. Provost says the company will continue to expand the reach of their products through education, social media, traditional advertising and sponsorships. The company has been particularly successful, as of late, with using social media to grow awareness of its education initiatives. It has new iPhone and iPad apps, a web TV show and over 750,000 followers on Twitter. "After a news article is published, we use Twitter to announce the article and then through the miracle of re-Tweeting, the existence of the article becomes instantly known," Provost notes. With the largest U.S. options exchange now public, and aggressively expanding its consumer marketing efforts, it seems a logical next step may be to consider sponsorships a little farther from home.